After a grand success thrice in Mumbai, OHMKara is happy to announce Gujarati Jalso to be organized in 10 cities in the U.S. in August 2017, a grand extravaganza of Gujarati culture, an experience like never before in a foreign land. The Gujarati Jalso has been the brainchild of artist Parthiv Gohil and then curated / executed jointly with Ajit Shah and supported by IMAGE and SVKM. It first came into being in 2013. The second edition happened in 2014 and the third one in 2017. Over 150 artists performed every year to packed auditoriums. Moreover, the Gujarati Jalso has reached a record number of over 4 lakh audiences and the number is only growing each year. The Gujarati Jalso has over 20k subscribers and over 5 million views. This year, Gujarati Jalso was streamed live both on its Youtube and Facebook pages and the huge number of live audiences world wide watching it left everyone spellbound. Gujarati Jalso means a tribute to our language, our culture, our heritage and our talented singers and musicians. 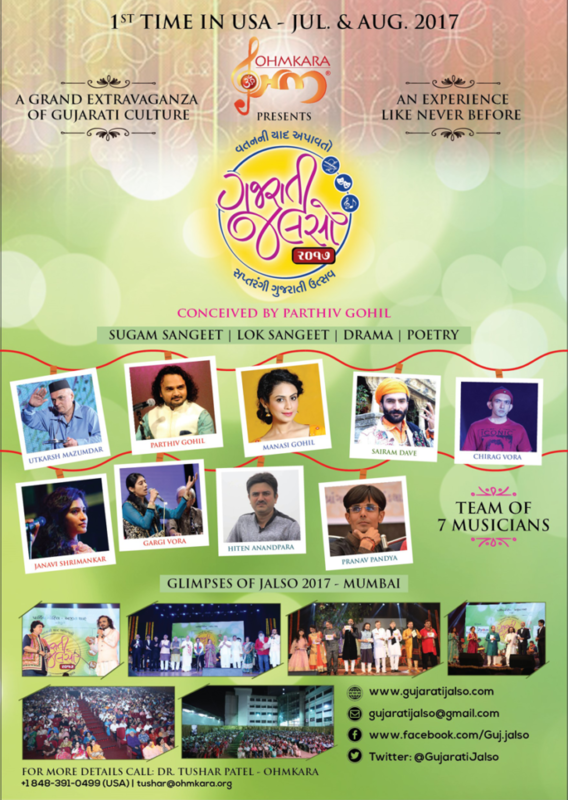 Under the banner of “Gujarati Jalso”, a unique show named “Panchamrut” is designed especially for the U.S. tour in 2017. It will be a collage / kaleidoscope of Sugam Sangeet, Lok Sangeet, Theatre, Poetry and Short stories. It will blend talents from different fields of music, drama and literature. The presentation will cover the fusion element to make the items lovely and lively. It will be a scripted presentation never attempted and presented before in the U.S. Each one in the audience would feel proud of being a Gujarati and an Indian. The team will include renowned Bollywood playback singer Parthiv Gohil, Poet Hiten Anandpara and Pranav Pandya, other renowned and young talented singers Jahnvi Shrimankar, Gargi Vora and king of the dayro and folk music Sairam Dave, stage, TV and drama artists Utkarsh Mazumdar, Chirag Vohra and a versatile singer actor performer Manasi Parekh Gohil and team of seven talented musicians will be a part of this musical journey to present a score for the whole show like a Broadway score. (Means they will not just play with singers but also with poetry, theater and other presentations) with a total duration of approximately four to five hours. The entire team of artists, technicians and production team will be of approximately a group of 18-20 people. For more details of the program or to hold a show in your city, please call Dr. Tushar Patel of OHMKara at 848-391-0499 or tushar@ohmkara.org.